This article was written by Christopher Munn, and first published in the Dictionary of Hong Kong Biography, edited by May Holdsworth and Christopher. The publisher, HK University Press, and author have kindly granted permission for it to be posted here. Thanks also to Christopher for sending the first image of the E-Sing bakery. The second image was included in the original article. From an old but impoverished Xiangshan lineage, Cheong Alum gave up his studies at the age of 13 and moved to Macau, where he learnt how to do business with Westerners. He crossed over to Hong Kong at the age of 18, became fluent in English and served as a compradore to a succession of American and European employers, including Murrow, Stephenson and Co.
Having become wealthy, he established himself as a baker and general provisioner. He bought a biscuit-making machine from George Duddell, set up the E-Sing Bakery in Queen’s Road East, and became a supplier to the Royal Navy, the British Army and the colonial community. In 1856 he opened a branch in Canton, selling wines. liquors, beer and perfumery, in addition to the best bread and biscuit. 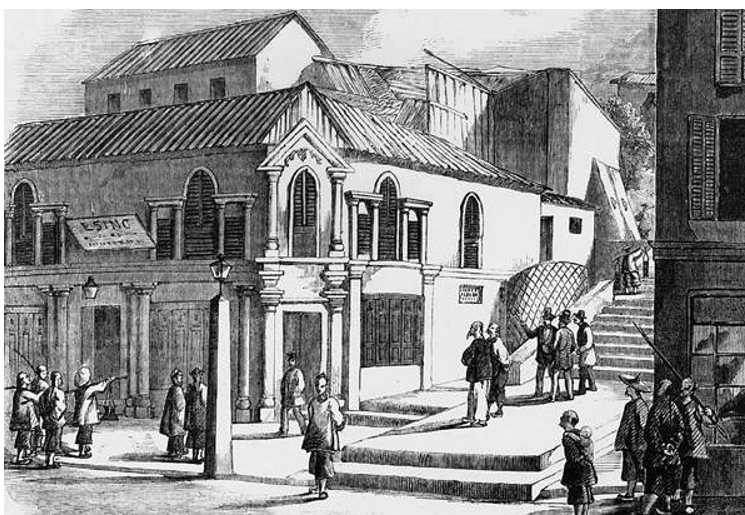 By the end of that year, as anti-foreign disturbances spread during the early stages of the Second Opium War, E-Sing was the only large bakery left open in Hong Kong and the main supplier of bread to Europeans. On 15 January 1857 terrorists exploited E-Sing’s dominant position by lacing its morning batch of bread with arsenic in an attempt to murder the whole colonial community. About 400 people were poisoned; no one died immediately, but many fell ill with vomiting and great pain. Cheong was an instant suspect, the more so since he had left for Macau early the same day with his family. He was arrested and brought back to Hong Kong. Many colonists, including W.T. Mercer, the Colonial Secretary, and Thomas Anstey, The Attorney General, called for execution without a proper trial. But the Governor, Sir John Bowring, whose family had been among the worst-affected by the poison, insisted that justice should take its course. 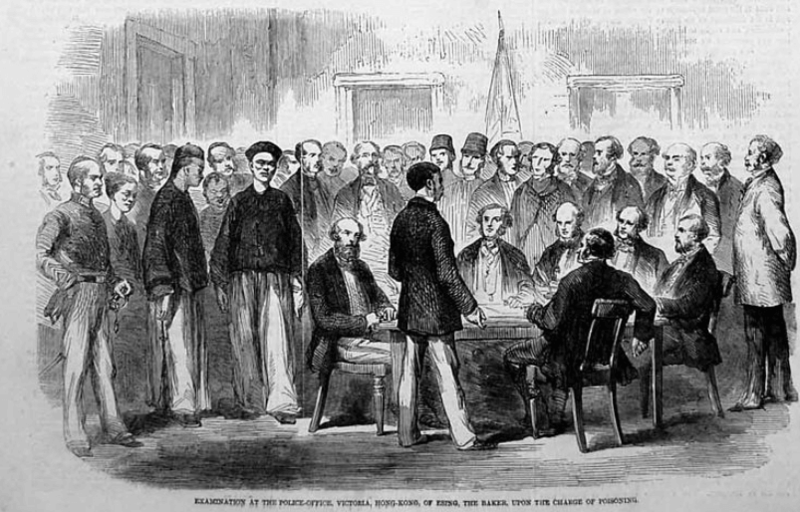 Examination of Cheong Alum, 1857. Cheong was put on trial with his father, Cheong Wye Kong, and eight others before a jury of six Europeans on a charge of administering poison with intent to kill. The prosecutor, Anstey, failed to establish a link between Cheong and the crime, or a motive: the ‘flight’ from Hong Kong had been with the aim of sending his family back to their home country; Cheong himself intended to return to Hong Kong, and had only the day before purchased large quantities of flour; his children, who ate bread on board the steamer, were among the poisoned. Cheong and his co-defendants were found not guilty. He was a tall, imposing looking man for a Chinese, and had been well educated. The respect and deference shown to him by all the prisoners were wonderful. On the Sundays, when I went to conduct a religious service with them, he quite took me under his patronage, had the books ready, and maintained perfect order amongst all who attended. The acquital of Cheong has often been presented as a glorious moment in English justice. Yet this was not the end of the matter. Cheong, his co-defendants, and many others from the bakery remained in gaol on the Governor’s orders in appalling conditions while various suggestions – all of them involving banishment – were offered by community leaders. Kate Lowe & Eugene McLaughlin (2015) ‘Caution! The Bread is Poisoned’: The Hong Kong Mass Poisoning of January 1857, The Journal of Imperial and Commonwealth History, 43:2, 189-209. This article was first posted on 22nd February 2018.